I’d last been up there ten years before. The landscape looked very different then, the snowfields more extensive, the light a purer white. 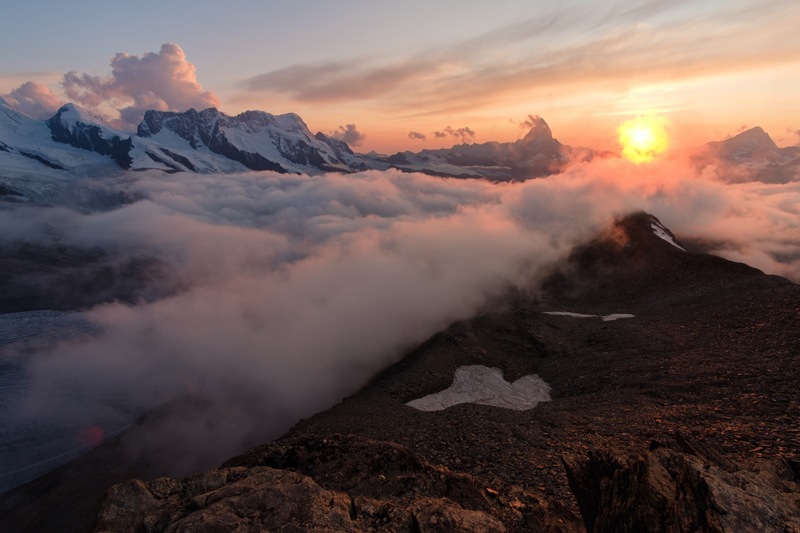 I returned a decade wiser, weighed down with knowledge of what humanity was doing to these mountains that I loved, and so my sunset from the summit of Stockhorn in September 2017 was tinged with solastalgia as I watched the light decay on rubble-strewn slopes that had been covered with ice last time I visited. My night up there at 3,800m was a transcendental experience. Distant thunder haunted my dreams, and my thoughts returned again and again to the conflict that it seems at times is at the very core of my soul: how do I protect these places that I love when the way I’ve chosen to earn my living involves telling others about them? There are no easy answers. The more people know, understand and care about mountains and wilderness the more people will rise up to protect them, but it’s also true that we are loving these places to death, and that the pressure of millions of boots is commanding a heavy toll. When all is counted and done, who is to say whether the prize is worth the cost? The mountains will always be here, they say, and that is true. But as the ice recedes, we lose something incalculably precious. The beauty of the Alps is not the same as it once was, and thanks to shifting baseline syndrome our descendents will never know these mountains as we know them – just as we cannot truly comprehend what has already been lost before our time. When you go to the mountains, tread lightly and speak softly. Everything we do has consequences that can’t easily be foreseen. Image © Alex Roddie. All Rights Reserved.